Discussion in 'Downhill & Freeride' started by woof, Mar 8, 2008. 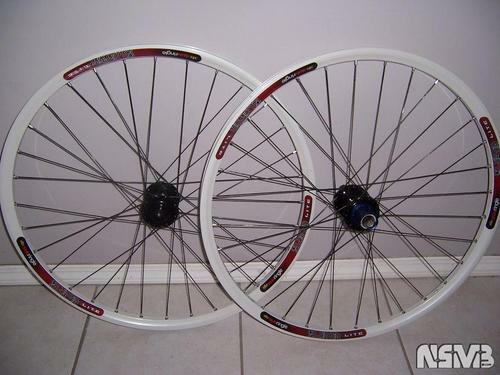 I'm trying to pick a set of Ringle rims to build my race wheelset. All the new numbers have me a bit confused, and I really don't know what the best width rim for a 2.5 - 2.7 tire should be. I think I need the MTX 31, but I don't know.. Any ideas?? And even thou Mavic is a great rim, I'm a Ringle boy. Or you can go against the ramblings of TheMontashu and run what ever you want for rims. If you want the mtx for rims, why not Run a MTX 33 up front and a MTX 31 on the back. I didn't think of two different sizes. Might be a good idea. single tracks are good, I've had great luck with them on my old bighit, and am running them on my hardtail. For a cheep rim that isnt to heavy there awesome. I have singletracks on my bullit. They are light for a dh rim while pretty strong. If you mess them up, they are $20. I was thinking about the ADD Lites. No problem with a maxxis 2.7 on the front with a 29mm rim?? For some reason I thought it needed to be a little bigger. If not we might have a winner. I havent ridden them yet. (saving them as race wheels) I don't plan on anything bigger than a 2.5 up front, shouldn't be a problem. Rhyno Lite XLs (550g) are lighter than MTX29s (570g) and Singletracks (590g). Same width as the MTX29. My LBS mechanic build a lot of sun rims for DH/FR/Urban/DJ and BMX. In his expirience the Rhyno Lite XLs are much stronger and more durable than single tracks. MTX29s are not proven and all the other MTX rims are much heavier than the Rhyno Lite XL. I'm building up a set of 24" Rhyno Lite XLs for my hardtail, this seems to be the lightest option for my application. If I were building 26" race wheels I'd go for the Mavic 721 or DT 5.1 (5.1 would be a better option for tubeless). I have been running rhino lite XL's for about 7 years. They may not be the strongest, but for their weight they are very strong. Not to mention they are cheap. I run mine ghetto tubeless now and have good success. I run a 26/24 combo and have been very pleased with the durability. Back in the day I had a Doublewide and it was wasted in one season. For nearly half of the weight, the Rhino lite XL has out lasted it many times over. They are way underated. Probably because they lack the bling of the new stuff. I'm making all my new parts out of pipe cleaners, macaroni and posicle sticks, Ill hook you up with custom rims.. no worries! Rhyno Lite XLs have performed great for me in the past. A rim will last me for a whole season, my current rear rim is two seasons old. It has cracked at the seam so I am going to be replacing it. Most of the time the rim out lasts the anodized coating for me, the rims always end up a faded bronze color. I have considered going with Mavic so I can run UST tubeless but when I can get almost three rims for the price of one, it is not a hard decision. Kill yourself. MTX's are awezome. Does anyone have any idea how to order from them w/ your Sponserhouse discount? They don't have a store on there & don't give you a discount code or anything either. I tried emailing them, but haven't heard anything back. 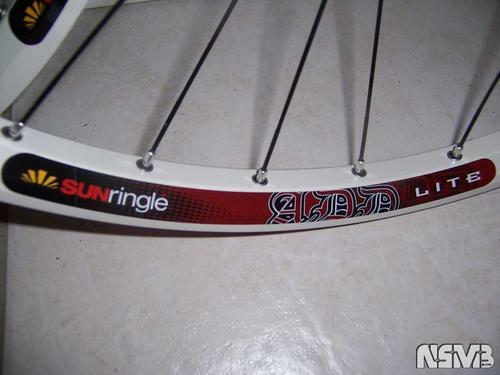 Sun Rhyno lite xl's are dope since universalcycles have them for $20 a pop. I've order me a pair there last year and they still have them. BTW, since noone mentioned this, Doubletracks and MTX's are the same wheel. The MTX 39 yes, the other mtx's, no. What are the differences between Singletrack (no SL1) and Singletrack SL1 ? Is it welded and sleeved (SL1) ? If i remember correctly, EightTracks=OEM and MTX=Aftermarket for the same rim? Not sure where the doubletracks fit in. If I were you and getting some race rims i would either get the singletracks or Add Lites. You should be fine with singletracks for race rims since you will typically ride smoother, especially if you were to have another wheelset like one with mtx's for bashing around.